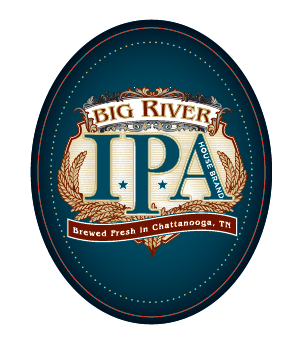 The House Brand IPA by Big River Brewing Company is a classic copper-colored ale with a pronounced hop aroma and assertive bitterness. American-grown Galena and Cascade hops are the star of this fragrant and citrusy dry-hopped masterpiece. You’ll savor the long-lasting flavor that will leave your taste buds tingling. Brewed at Big River Grille in Chattanooga, Tennessee, this bittersweet ale is perfectly paired with a spicy dish such as the restaurant’s signature Pasta Jambalaya or Churrasco Steak Tacos. The House Brand IPA is available in 6-pack cans or a convenient 5-liter keg for long-lasting freshness right from your home’s fridge.